Without a doubt, menopause does affect teeth and gums. Similar to other body systems, estrogen receptors have been found in oral mucosa and salivary glands. Thus, as estrogen levels decline with age, menopausal women may find themselves facing a plethora of gum problems, including burning mouth syndrome, gingivitis, periodontitis, increased number of cavities, and more. 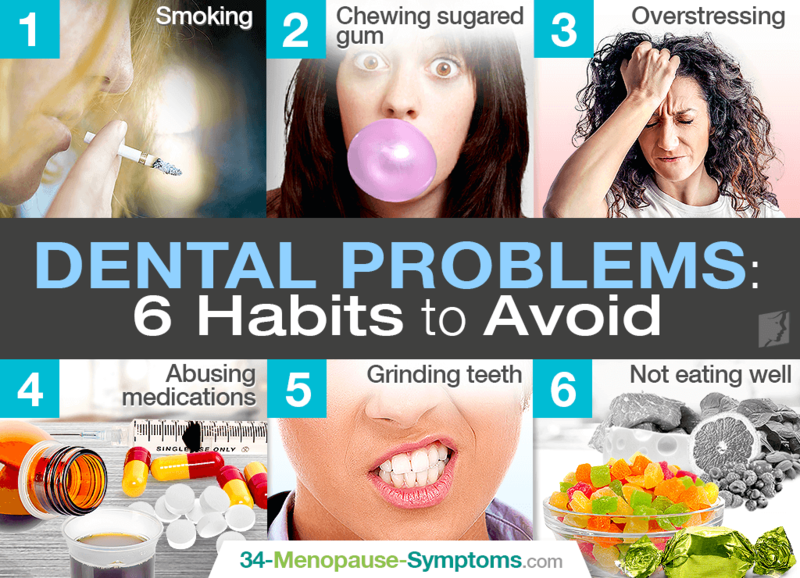 Continue reading to learn about six habits to avoid for optimal teeth health, and don't let menopause dental problems get in the way of your transition into your twilight years. Not only is smoking cigarettes linked to an increased risk of heart disease, cancer, and diabetes, but it is also linked to periodontal disease. As a matter of fact, tobacco smoking, mainly as cigarettes, is acknowledged as the most significant environmental risk factor in developing periodontitis. When combined with an estrogen deficiency, do your menopause teeth a favor and try to find ways to drop the pack today. Make sure that you are chewing gum that does not contain sugar because this can escalate your chance of contracting cavities. Nevertheless, don't avoid the act all together. Chewing gum helps stimulate the production of saliva, which is a natural cleanser by washing away acids produced by the bacteria in plaque on your teeth. This increased saliva strengthens tooth enamel by carrying with it calcium and phosphate, hopefully alleviating some menopause dental problems. Stress can cause people to turn to numbing agents like drugs, alcohol, and tobacco, all of which can lead to higher levels of cortisol in the bloodstream. Moreover, higher cortisol levels lower your immunity, thus having adverse effects on oral health by increasing your risk of mouth infections and gum disease. Not just illicit drug use, but abuse of prescription drugs can damage the health of your teeth as well, leading to inflammation, bleeding, ulceration, and further dental problems, such as dry mouth, tooth loss, and diseased gums. The list of medications that can damage teeth and gums includes antihistamines, aspirin, chemotherapy medications, immunosuppressive medications, syrups, antibiotics, and more. Sometimes a byproduct of stress, teeth clenching or grinding - called bruxism - can harm your teeth and enamel and also cause jaw soreness and consequential headaches. Often times, teeth grinding or clenching happens over nocturnal hours. Ask your dentist for an appropriate night guard to protect your teeth from harm. Often we are told to steer clear of sugar since if it's left to decay on your teeth, it can cause cavities. However, we need to have other vitamins and nutrients in mind as well for dental health. If you deprive your mouth of certain nutrients, you may put yourself at higher risk of worsening menopause dental problems. Calcium, vitamin D, zinc, iron, and antioxidants are all necessary for optimal periodontal health. Talk to both your doctor and your dentist about what you can do to alleviate your uncomfortable menopause dental problems and gum symptoms. Poor lifestyle choices can often result in exacerbated symptoms, but they are not the only cause. If you are making healthy choices and still experiencing severe gum problems, consider further alternative gum problem treatments. By treating the underlying cause of hormonal imbalance, you can go back to having confidence in your smile.